Transponder keys and key FOBS have given us a level of security and convenience that we have all grown used to. Since 1995, we have enjoyed ease of access and the peace of mind knowing that our cars are secure. But when we lose our keys, the technology that we loved a minute ago now feels like an inconvenience. When you have an available locksmith, losing your keys, needing key FOB replacement, or needing new transponder keys feels like less of a horrendous ordeal and more of an inconvenience. Affordable Locksmith of Texas is here for residents of Spring, The Woodlands, and the surrounding areas, but first, what is a transponder key? Transponder keys have devices called “engine control units,” or ECU, that send a signal to your ignition switch that disables the immobiliser in place. If you do not have a matching key, the immobiliser will not be disarmed and you will not be able to start your car. Car manufacturers began using transponder keys as a means to provide their customers extra security and to prevent thieves from hot wiring their customers’ cars. Keys with transponders have thicker plastic attached to the key as part of the key structure or in the FOB device that you are given for keyless entry and push starters. Key FOBS aren’t always transponder keys. A key fob is like a transponder key, except it is not a part of your actual key. Most modern key FOBS transmit wirelessly, giving you keyless entry, and have to be programed for your car. 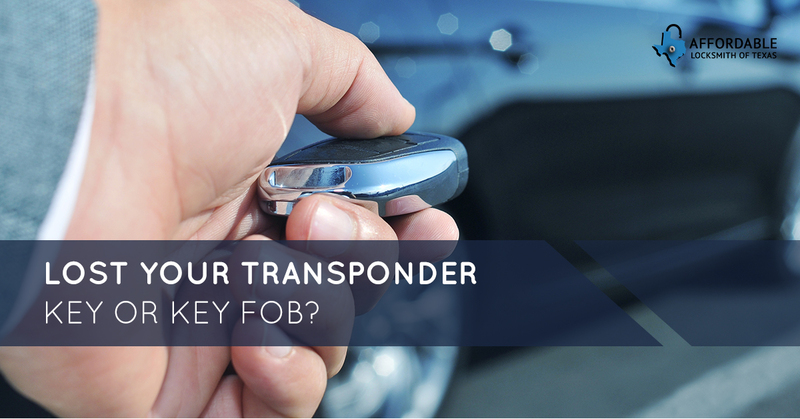 FOBS transmit radio signals to your car and unlock or lock your car, and some have the capability to open your truck. Though it may seem silly to differentiate between transponder keys and key FOBS, it is important to know what you have in case you lose one or the other and need a replacement. What If I Lost Mine? If you have lost your transponder key or your key FOB, don’t panic! First, retrace your steps. If you still cannot find your transponder key, call us! Though you could order your key FOB replacement or transponder key from the dealership, why spend more than you need to? Affordable Locksmith of Texas offers competitive prices, high-quality products, and professional workmanship. We are licensed locksmiths, meaning we hold ourselves to high ethical and professional standards. The 24-hour locksmiths of Affordable Locksmith of Texas are available rain or shine, day or night, and will respond within 15 minutes of your call. We offer professional transponder key and key FOB replacement. The 24-hour locksmiths of Affordable Locksmith of Texas would love to help you the next time you find yourself locked out. Call or contact us online and we will get back to you within 15 minutes. We serve clients in Spring and The Woodlands area and would love to get you into your car and back on your way. Contact us! First time clients get 10 percent off their first service. Stay tuned for more blogs about transponder keys, tips for security, and more information about our services!